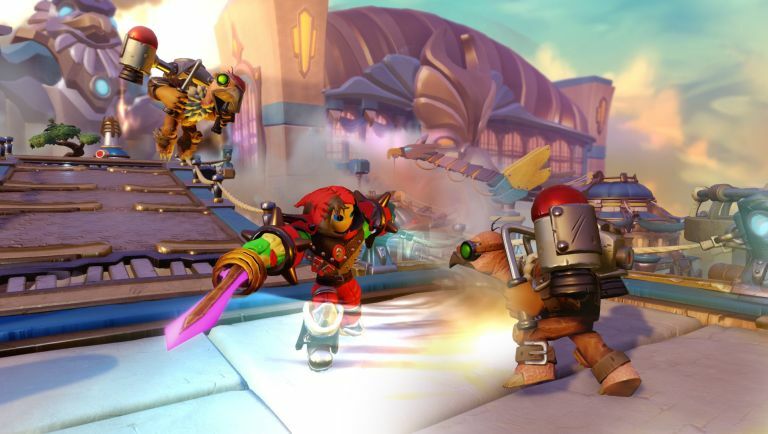 Disney Infinity may have been put to the sword earlier in the year, but that has't stopped Activision ploughing ahead with patient zero of the toys-to-life phenomenon, Skylanders. The latest annual incarnation of the Diablo lite platformer, Imaginators, is all about creating your own Skylander in game with hundreds of mechanical parts to choose from. Annoyingly, you can't build your new 'Lander physically (although Activision have discussed the potential of 3D printing select creations in the future), but you do use a special Creation Crystal (included with the Starter Pack, acting like one of those Traptanium Trap Crystals from 2014's Trap Team) that sits on the Portal of Power accessory much like a regular model. You can basically customise everything about your hero, from its elemental powers to its voice and weapons of choice. Just because the central gimmick this year is digital only, doesn't mean there aren't plenty of new regular physical models adding to the series' already impressive 300+ roster. The best of which, the Senseis, see fan favourites return with new powers and abilities to teach your new creation how to be a proper Skylander. (No word whether one of these 31 masters will include Spyro the Dragon, the once great PlayStation mascot that helped launch the series in 2011. Set for release on 14 October, Skylanders Imaginators will also be one of the few big games this year to still support last-gen - Activision has confirmed PS4, Xbox One, PS3, Xbox 360 and Nintendo Wii U.